I recently promised that I’d post my latest reading of the Bear-o-meter in early May. 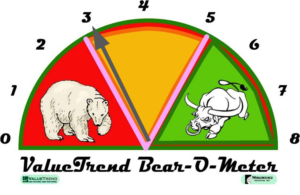 As a refresher, to those new to the blog, the Bearometer is a compilation of 12 indicators. 2 are trend indicators, 4 are breadth indicators (although I use 2 of them as momentum indicators), 1 is a value indicator, 3 are sentiment indicators, and one is plain old seasonality (best/worst 6 months). Each indicator can earn a positive, negative or neutral score. Some of the indicators are read twice—for example, I look at slopes as well as relative positions for the A/D line and moving averages. The Bear-o-meter provides a relative risk/reward reading. A low score indicates more risk – a high score indicates less risk –all relative to potential returns. It can be used as a guideline to measure risk vs. reward—understanding that both are always present on the market. Just because the Bear-o-meter reads low does not mean there is no potential for further upside, and vice versa for a high reading. You get the idea. Currently, the compilation suggests a reading of “3”. This is the same level that it read on March 7th. Since the March 7th reading, the market has been flat (slightly down actually). So far, the indicator looks to have painted an accurate picture of the reward/risk potential. Of interest, almost all of the positive scores on the indicator this time came from trend and cumulative AD line breadth. All other factors in the compilation read neutral or outright bearish. The message for now is—don’t run for the exit, but certainly keep a bit of cash in your accounts and focus exclusively on only the highest quality equites you can hold. The Bear-o-meter continues to point towards a flat, possibly even choppy ride at this time. I’ll revisit the Bear-o-meter in a few weeks and post its reading. Please note – our Performance Results for April 2017 can be seen here. I love your Bear-O-Meter. I’m sure most of your readers watch the market closely as I do. And I would agree with it (Bear-O-Meter). Markets are still performing but I would expect to see the “Sell in May” phenomenon pop up again this year. Hope it’s not too serious. And I see your Equity portfolio is “brag worthy” in April. My three trading accounts are also up, 1.54%, 3.1% and 2.14%. These, and yours, beat the TSX and S&P500 handily. Lately, I have been following the $CRB, $TSX, $USD and trying to analyze the correlations. The normal correlations seem to be deviating (especially since the beginning of the year) and are looking strange to me. Maybe this is something you could post on. The TSX is oddly overvalued given the weakness in commodities since the beginning of the year. I am still expecting some sort or seasonal/technical correction (or at least pullback) over the next couple weeks/months, and can see it starting to show up on the charts over the last couple of weeks with prices falling below the 20 day MA and some momentum indicators confirming weakness. I have heard that there are only a few of the major stocks that are holding up the S&P 500, but on the TSX, it seems the breadth is still quite good. I can’t help think the valuations are high based on simplistic P/E. The $VIX at record low levels is also a concern. This is an interesting market and look to me like real stock pickers market short term. I think active managers like yourself have the advantage. Keep posting, I think we are going to need your help. Cheers. I may do a commodity update and look at the USD on the blog. Thanks for the idea Ron. So yes, either adapt an active approach or use a technically inclined manager. The buy /hold thing feels good only when markets go up–and we’ve seen enough volatility to know that those good times seem to shift into big corrections when they end. I have only been trading half of your years of experience, and not professionally or full time, but have felt the same challenges especially since 2009. With all of the various ways the market has been influenced by central banks around the world and technological influences on trading, it has made analysis in general a lot less effective. I think technical analysis is still one of the best ways to reflect whats going on (not necessarily why), but I have had to accept more volatility. Trading with this volatility has been an adjustment for sure. Thanks for your comments here and on BNN. I was able to glean some important information from your comments on BNN that helped with my thinking. re-enforces why your confidence in trend analysis, base and breakout prevails. Appreciate your thoughts on the C$ — I think we have more room to drop. In fact, watch for a blog today (Thursday)-I’ll publish it late morning-I am bearish on Canada’s outlook–sorry, patriots. But I have my reasons – and I will cover them in the blog.